*Just a quick note to say that I know the correct spellings of most of these players will be wrong, due to the amount of accents included, but due to the fact I don’t know how to get the correct ones up, this isn’t possible to do. So, apologies for this, but I’m sure it’s understandable! Anyway, on with the show…. It finally arrived! The final day of the season was finally upon me and what a way to end it off. 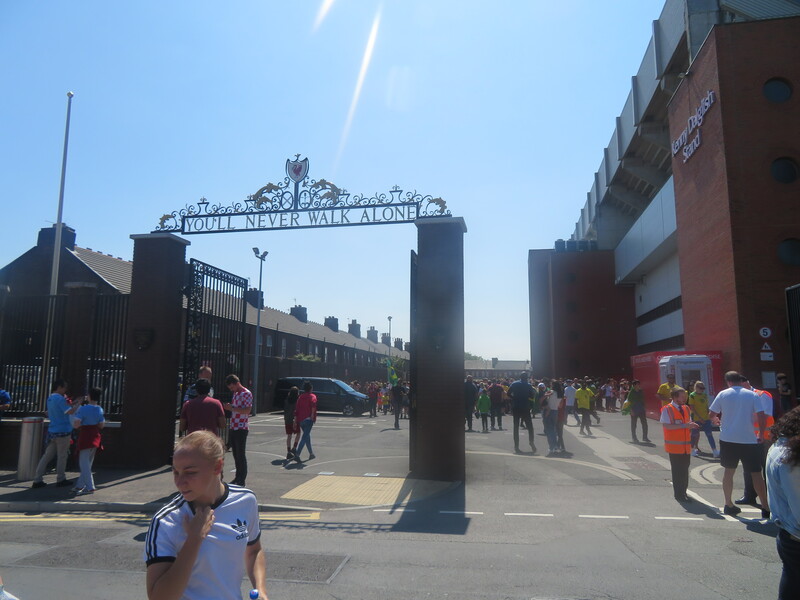 After eleven whole months and spanning over 80 matches, I was finishing up at Anfield, having started at the start of July at AVRO’s shiny, new home, the renovated Whitebank Stadium in Oldham. 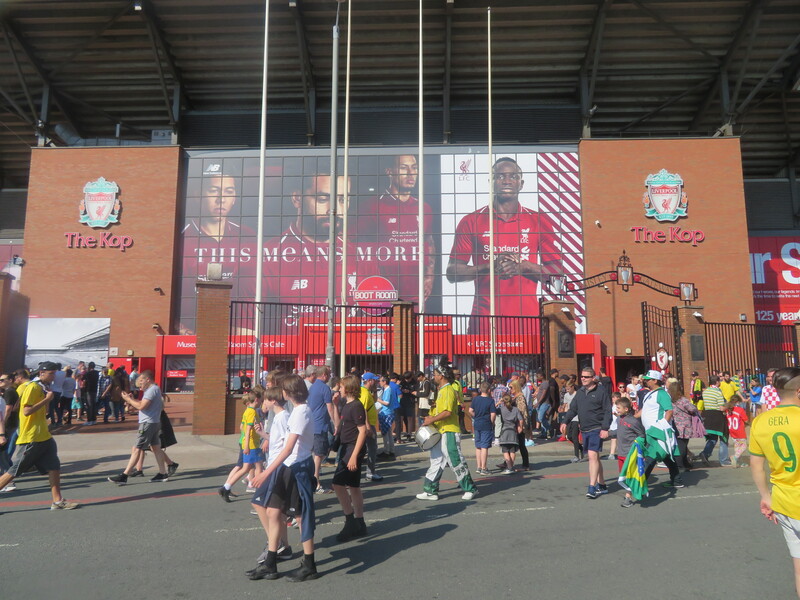 Indeed, that game featured the visit to Manchester of Lower Breck F.C, whose Anfield Sports Club home is located a short walk from its more famous neighbour, somewhat bringing a tidy end to proceedings. 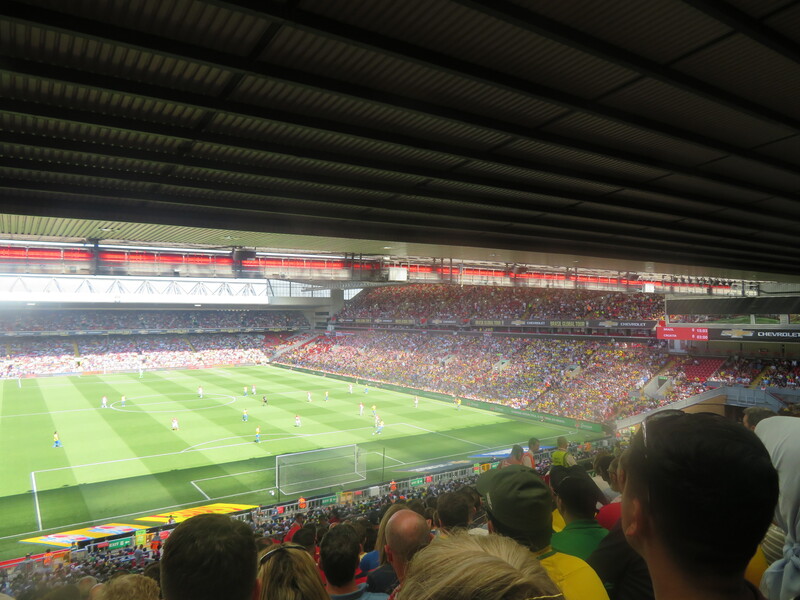 To Liverpool it was, but it was for an interesting friendly contest, pitting the 5-time World Champions Brasil against the talented Croatian side including the likes of Luka Modric, Ivan Rakitic and Mateo Kovacic, amongst others. 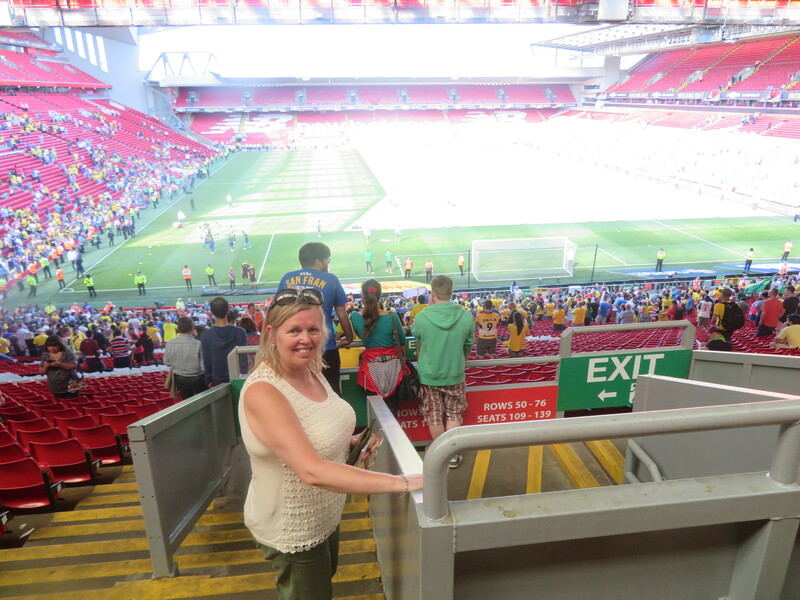 With my Mum being a mad Liverpool fan, and having a wide interest in the game as a whole, I brought up this game to here and she was immediately interested in joining me on the trip, even going as far as paying for both our tickets (thanks, Mother!). My Dad also found his charitable side(!) and offered to drop us off, and with the Liverpool-Manchester line undergoing works, this was more than welcome as well. 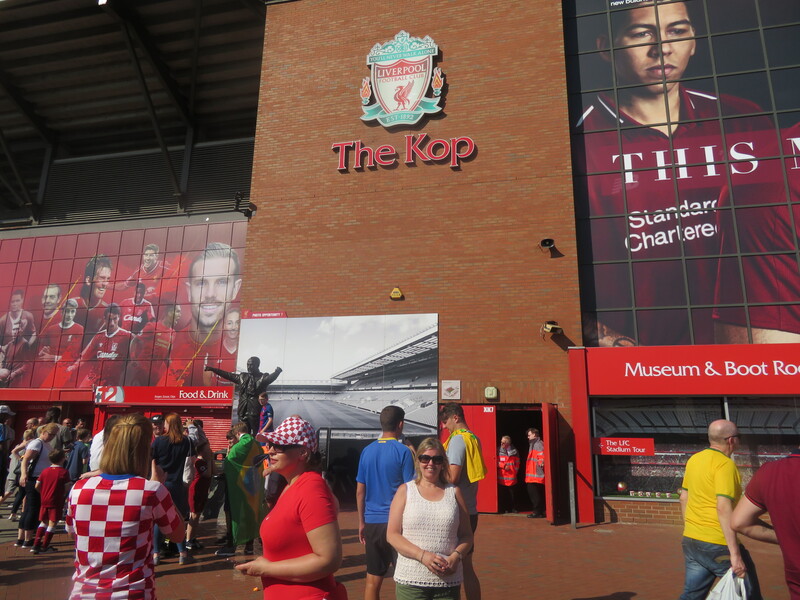 A problem-less hour’s drive later and we were being dropped off outside the famous Kop End, but there wasn’t so much of the Liver Bird on show today, as the yellow, blue and green of the Selecao and the classical white-and-red chequered shirts of the Croats. 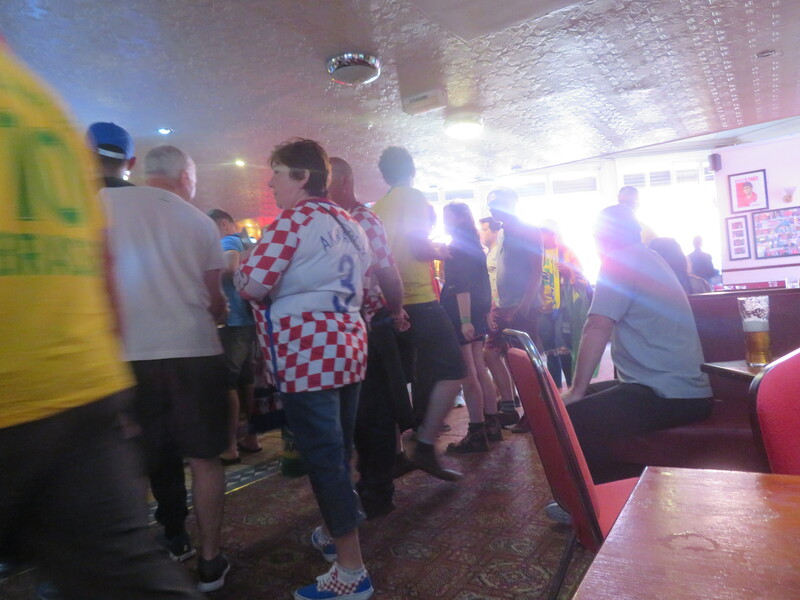 Both nation’s flags were on display widely too (be that by natives of both countries, or neutrals with an interest in either), though my Mum was understandably attracted by the Red flags adorning the outer walls of the Twelfth Man pub, and it was here our day began in earnest. Finding out my phone had gone walkabouts upon entering, a call to my Dad was required to reunite me with said necessity, which had attempted its escape. I’d have been lost if I was alone! Panic over, I could enjoy my pint of Hop House, whilst my Mum carried on her new-found liking of Strongbow’s Dark Fruits. 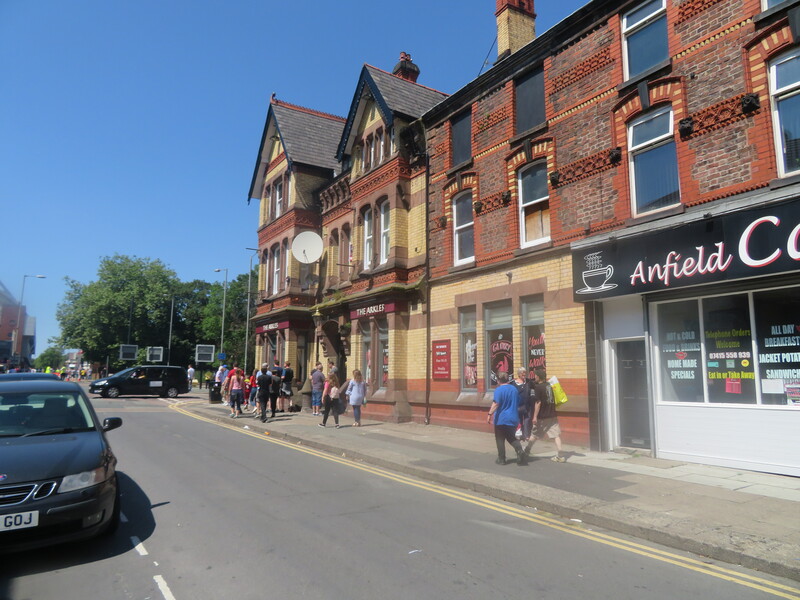 With the pub getting ever busier thanks to an influx of supporters of both countries, we exited and headed onwards to the outside of Anfield, but we weren’t headed for the ground just yet my friends, oh no. 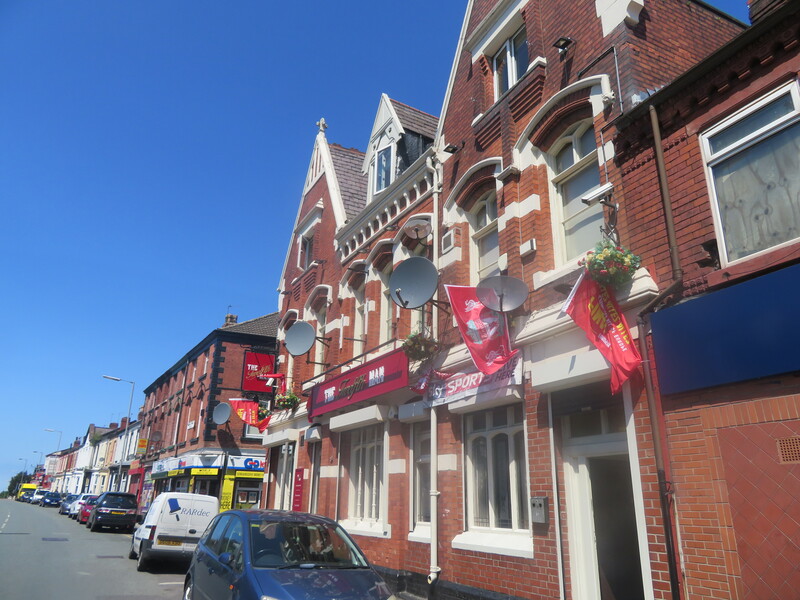 Instead, it was to The Albert, a large Victorian pub which sits right alongside the Paisley Gates and in front of the Kop. It was packed in here with both sets of supporters again mixing superbly and getting on well together, which was a theme of the day. 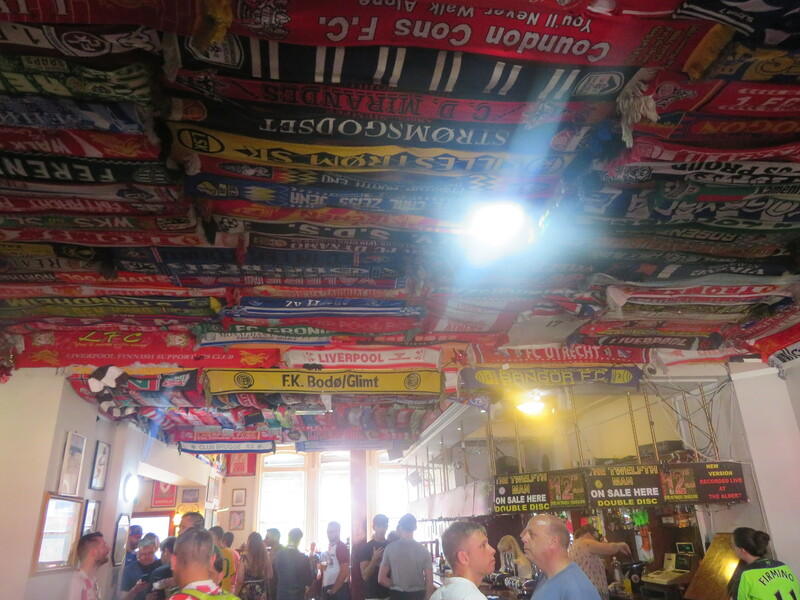 With it being so full and space at a premium, the pint of Carlsberg (it had to be, didn’t it, with the Liverpool connection!) went down quickly prior to us continuing on slightly away from the ground and to our next venue, The Sandon or, more accurately, its neighbouring matchday bar, Dodd’s. 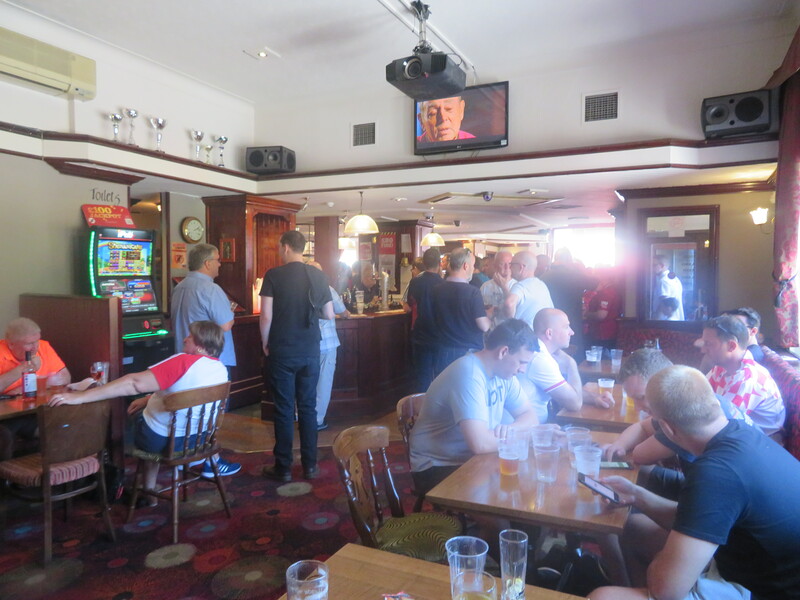 Dodd’s was nice enough too though, once again, it was full of fans of all persuasions enjoying a pre-match beverage or two. Its archway-filled interior gives it a cool feel and it has a sort of clubby vibe to it I felt, which lends it something of a different look. Anyway, Coors in hand, we found some space up near the pool table and latterly secured a table which were certainly at a premium, with it seeming to be the case that there was no outside area. Sadly, it turned out there was as we departed around the corner, the car-park area full with even more punters and rocking. A shame, but the final pre-match stop was calling. 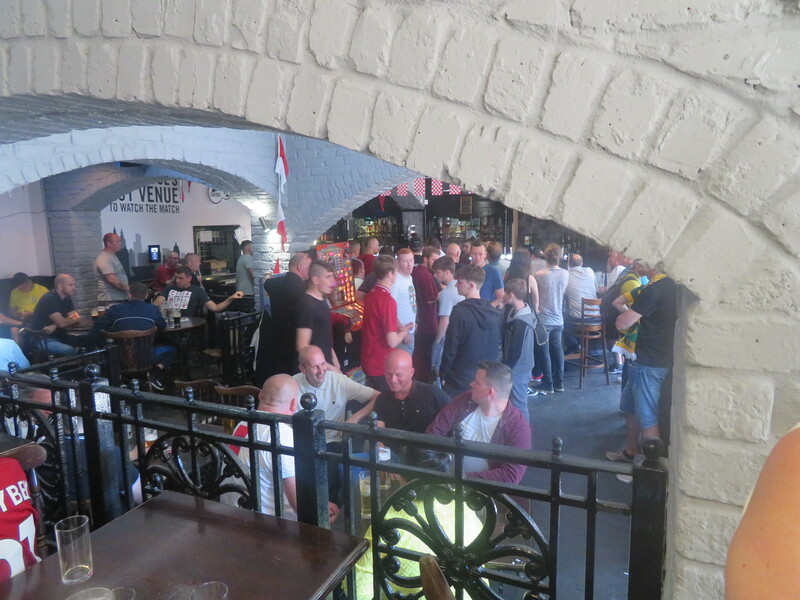 The Arkles was up next and despite it having some suspiciously Evertonian-looking turrets adorning its steps, is another staunch Liverpool pub it seemed, with the Reds’ memorabilia being far more obviously on show. You can guess who was in here by what I’ve said before, so don’t want to bore you with a repetitive theme! Anyway, with time ticking down to kick-off and me wanting to get there in far better time than I’d ended up doing the previous day – at Wembley for the England-Nigeria game – I finished off my pint sharpish and navigated our way the long distance back to the ground and the Shankly Gates. Just kidding, they’re about a minute away! 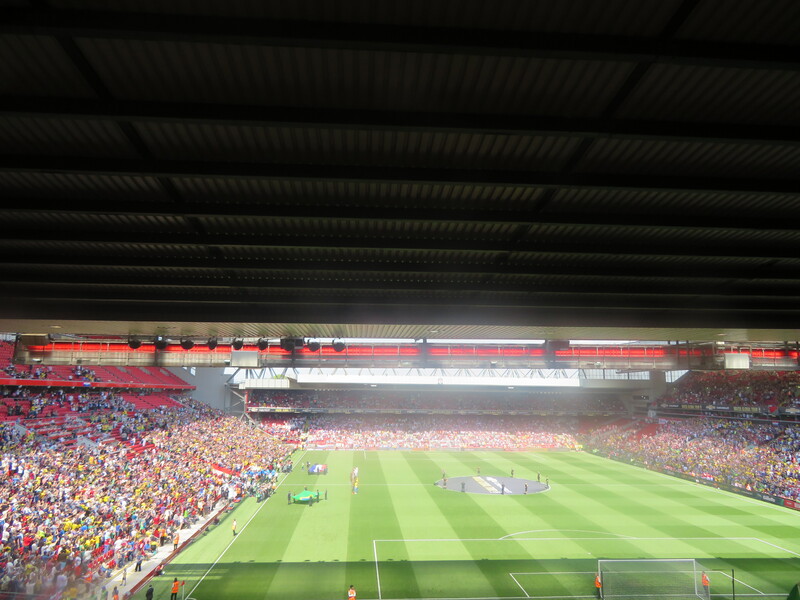 Following a standard visit to the touching memorial to Hillsborough, decked out as ever with loads of tributes to those so tragically lost in such a terrible way, we continued on to the Kop’s turnstiles and, following the standard bag check, were swiftly inside – Anfield seemingly far better organised than Wembley in this case, regardless of the difference in crowd size. Scanning our £30 tickets (my Mum found this rather tricky, being not as versed in the recent, more technical ways of ticketing….sorry Mum), we quickly cut the crowds and headed up the steps, finding our seats in the middle of one of the Kop’s many rows….despite having picked out seats on the edge of the row whilst buying online. 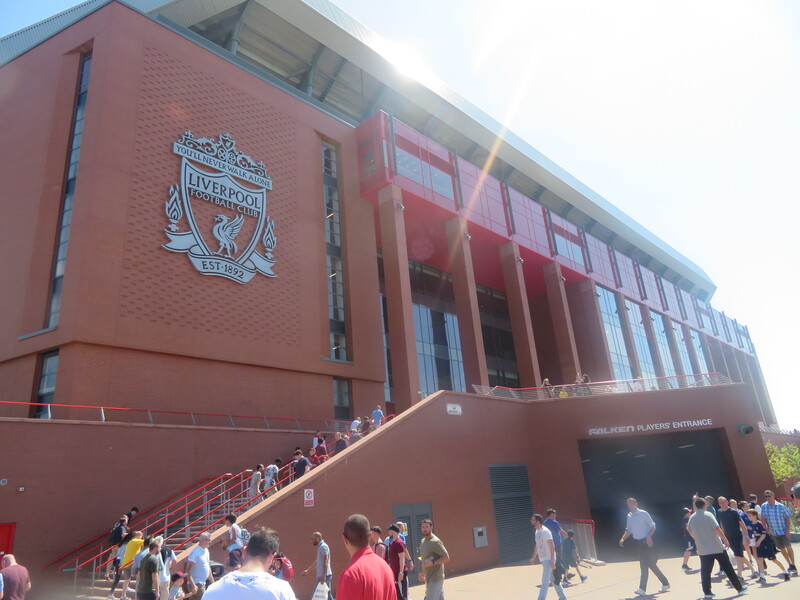 Hmmmmmm…..
To the Kop. VVD’s a bit shorter in the flesh! 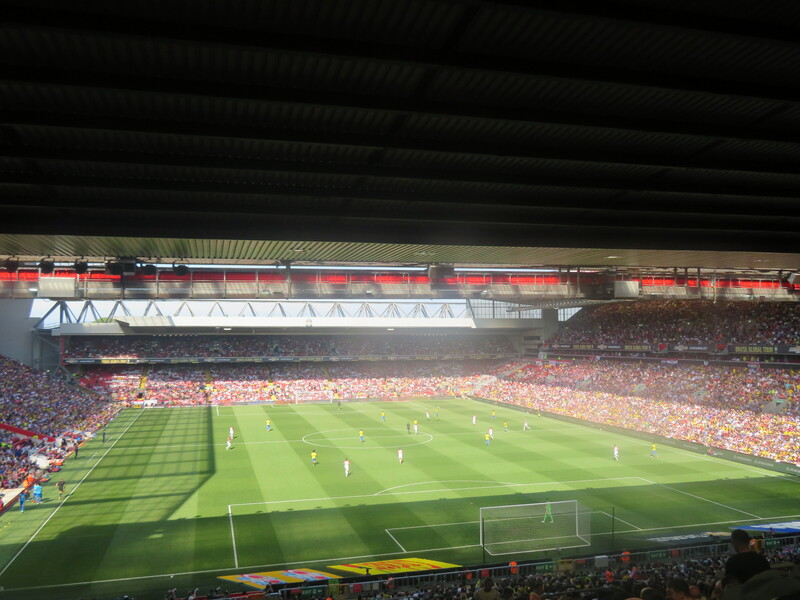 Anyway, we still had fine seats for viewing the game from, just off from centre and slightly to the left of the goal as you look from the stand in question. 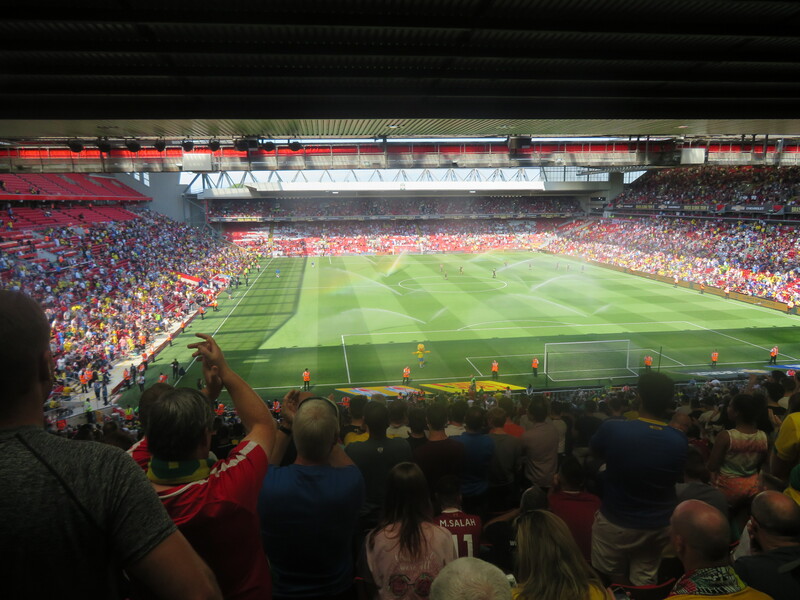 The sides soon emerged from the tunnel and after the Brasilian fans next to us belted out their national anthem loudly and proudly, the Croatian fans – largely grouped together down the far end in the Anfield Road stand, had their turn too. Both anthems were respectively received by their opposite numbers (and everyone else too) and we were all set to go. Brasil’s talismanic forward, Neymar, would be starting from the bench today, continuing his recovery from injury. Indeed, this wouldn’t be the first time I’d seen him, though the previous time was a far closer affair. Are you sitting comfortably….? It just so happened I was lucky enough to work security for a short time during the 2012 Olympic Games, guarding the hotel where the players were staying when playing at Old Trafford. Brasil happened to be one of the teams (along with Spain, South Korea, Japan, Egypt and Morocco(? 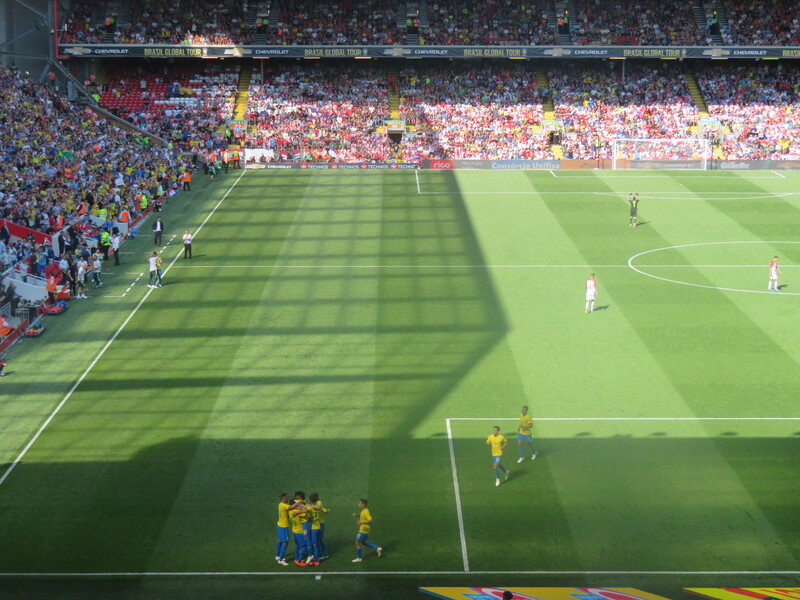 ), whilst the USA and Canadian women’s sides also stayed prior to their clash). I’d make a point of saying ‘Hello’ to all about (as you couldn’t do much else) and so that was how I managed to get a thumbs up from him, along with a full conversation with Leandro Damaio, prior to them playing ping-pong together. I hope Neymar’s improved his skills on that front! The game pitted the five-time World Champs against Croatia, whose best World Cup performance was a third-placed finish at the 1998 tournament in France, the first I can remember watching! Whilst the Croatians have a less than impressive record in terms of honours, winning only the Hassan II Trophy in the 1996 tournament (besting Morocco, Nigeria and Czech Republic) and the 1999 Korea Cup (the 23rd and last edition of the competition), contested against South Korea, Mexico and Egypt. They also finished as runners-up in the 1997 Kirin Cup, finishing behind hosts Japan, but ahead of other competing nation, Turkey. A more dubious “honour” is the fact that Josip Simunic was shown three yellow cards in a match against Australia by Graham Poll in the World Cup of 2006, but wasn’t sent off as, apparently, Poll thought he was an Aussie due to his Australian accent. Yeah, we all believe that, it’s easy to get confused when they’re wearing the same…oh. Meanwhile, Brasil’s record is nothing short of exemplary. Alongside their 5 World Cup titles (1958, ’62, ’70 & ’94 & 2002), they have also finished runners-up twice, in each of the 1950 & 1998 tournaments. They have also lifted the Confederations Cup on four occasions (1997, 2005, ’09 & 13), finishing runners-up in 1999, and have won the South America Championship (now the Copa America) on eight occasions, these coming in 1919, ’22, ’49, ’89, ’97, ’99, 2004 & 2007 and have finished runners-up on no less than eleven occasions. They also added two Panamerican Championships to their long list of honours, these coming in 1952 & ’56, whilst they were losing finalists in the 1960 tournament too, meaning the competed in each of the three finals during the competition’s tenure. 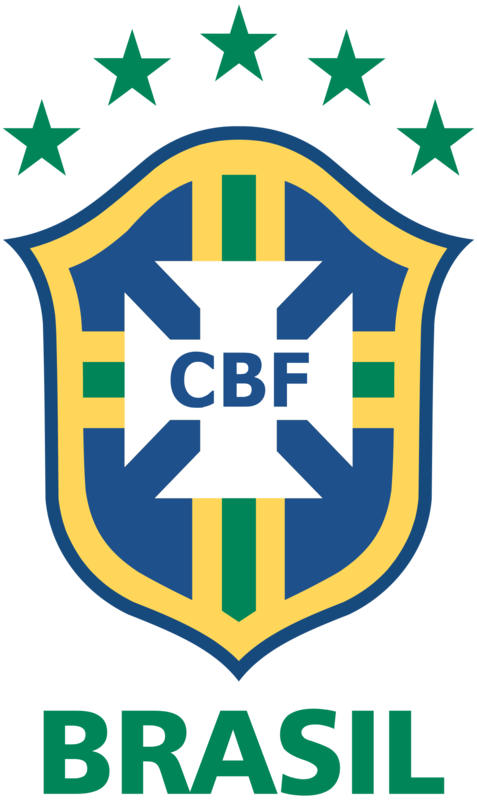 In addition to these more major honours, Brasil have also won numerous friendly tournaments during their glittering history. Their multiple title wins include 11 Copa Roca’s/Superclasico de las Americas (between 1914 & 2014), seven Copa Rio Branco’s (between 1931 & 1976), eight Taco Oswald Cruz titles (between 1950 & 1976) and three Taca do Atlantico titles in 1956, 1970 & 1976. In addition they have won one each of the Taca Independencia (1972), USA Bicentennial Cup (1976), Rous Cup (1987), Australia Bicentenary Gold Cup (1988), Umbro Cup (1995), and the 2005 Lunar New Year Cup. They have also won four Gold Medals at the Pan-American Games – these coming in 1963, 1975 (shared), 1979 and 1987, two Silvers (1959 & 2003) and two Bronze (1983 & 2015). In the Olympics, Brasil have taken just a single Gold Medal – in their home 2016 Rio Games, whilst winning three silver medals (1984, ’88 & 2012) and two Bronze (1996, 2008). However, the CONCACAF Gold Cup has eluded them, with Brasil finishing runners-up in both the 1996 & 2003 tournaments whilst also finishing third in 1998. Enough of the nostalgia trip (also known as blowing my own trumpet) and let’s get on with the game. From kick-off, it was definitely a slow burner, however this didn’t mean it wasn’t still highly watchable. 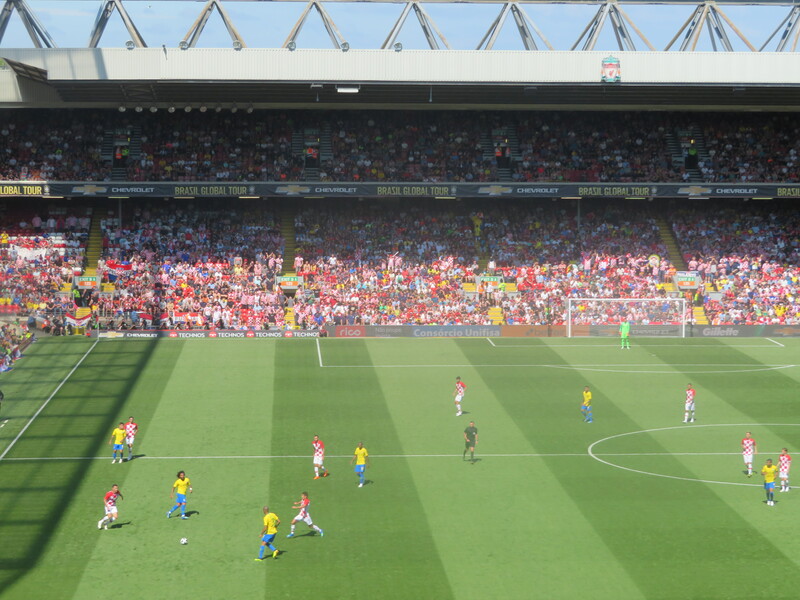 The first twenty minutes was largely interrupted with a number of fouls and offsides, before Dejan Lovren nodded the first true chance of the game narrowly wide on his home turf, before Andrej Kramaric forced Brasil’s ‘keeper Allinson – who may also be soon playing at Anfield on a regular basis if rumours are to be believed – into a fairly comfortable stop. Luka Modric was running the midfield for the Croatians, with Ivan Rakitic providing good cover for the defence at times, whilst also transferring into a more attacking role when required. 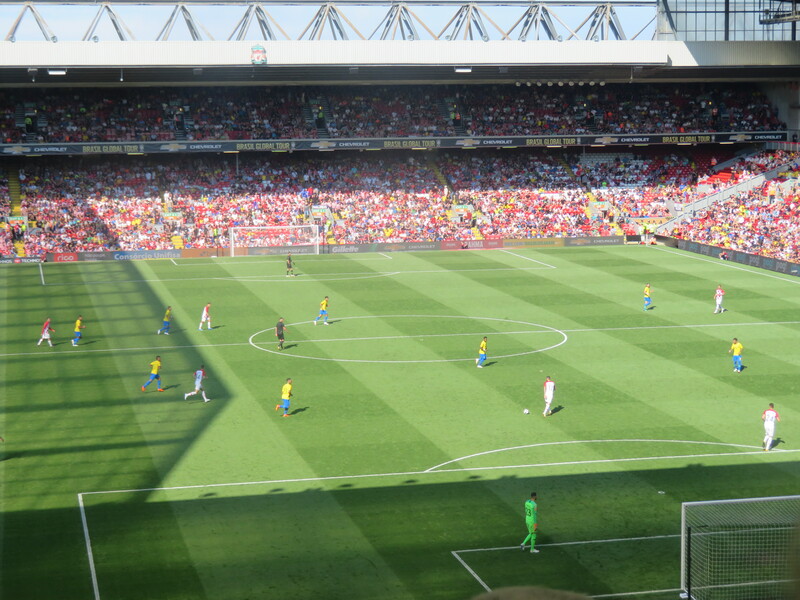 However, it was Phillipe Coutinho, returning to his former club’s home ground, who had the next attempt, firing high and wide into the Anfield Road End behind Danijel Subasic’s goal. After this, there was little between the sides in the way of chances, with only a few blocked efforts for Willian and Paulinho being seen prior to the break. 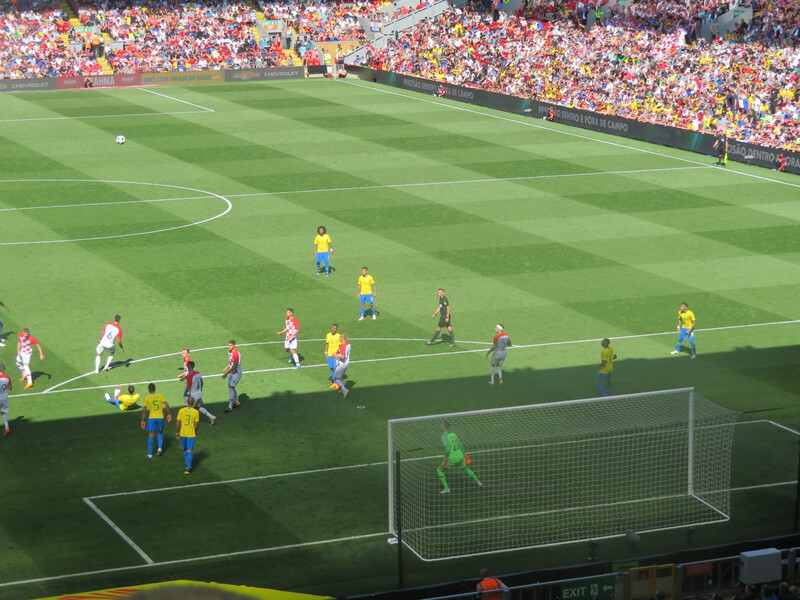 Half-Time and the majority of the crowd around Anfield were hoping for the appearance of Neymar to spice up the contest. 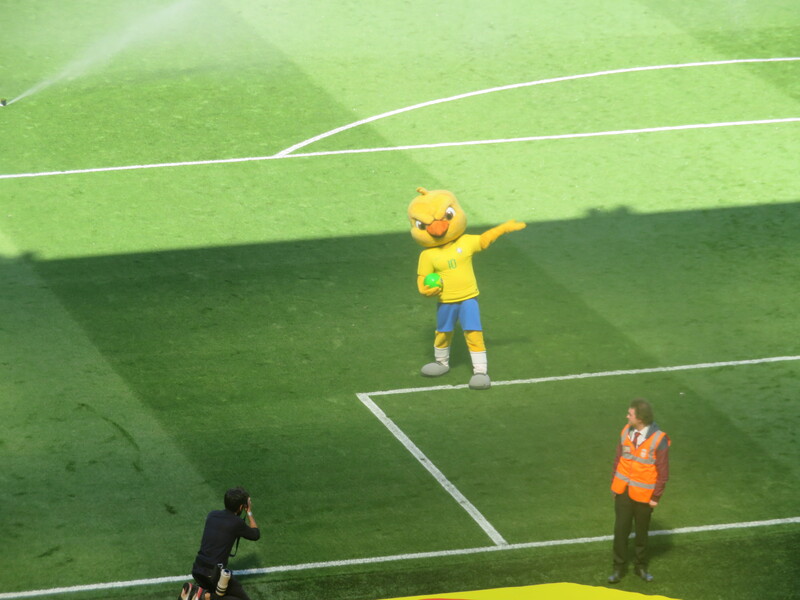 The break saw the fans treated to the appearance of a bird mascot kitted out in a full Brasil kit, who went on a lap consisting of posing and keepy-ups which lasted the whole 15 minutes. Finally, his display was at an end and he received a warm reception for his efforts, as the bird (which obviously isn’t a man dressed up, for the assurance of any kids) made his way back off the pitch. He was soon replaced by the 22 players and officials, with Neymar indeed being introduced for the second forty-five, entering the field to loud cheers around the ground. The vast majority of the Selecao’s play during the second half went through Neymar, whose influence on the game grew quickly and impressively, considering it was only his first game back after injury. Both full/wing-backs Marcelo and Danilo saw shots fly off target (the former’s a fair bit closer), before Neymar’s first attempt was at least on target, forcing Croatian gloveman Subasic into a low stop. Modric departed the scene soon after this, being replaced by Mateo Kovacic and this seemed to lessen the attacking forays Croatia embarked on. 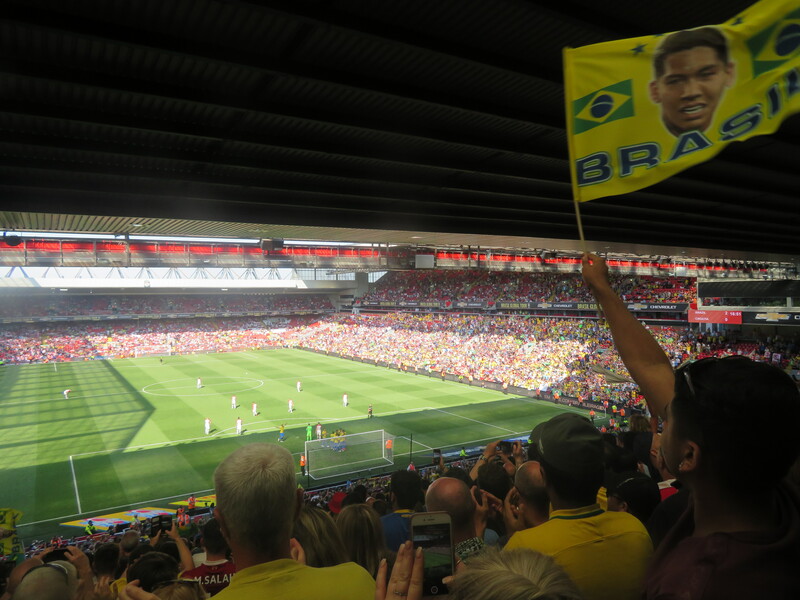 At the other end of the pitch, Roberto Firmino (or “Bobby” to his friends around here) was introduced on the hour to a similar reception to that of Neymar fifteen minutes before, replacing today’s skipper, Manchester City’s Gabriel Jesus, who’d toiled away for little reward up front. Nine minutes later, the opener finally arrived and, of course, it was the South Americans’ talismanic #10 who grabbed it. After receiving the ball at the end of a move involving Willian and Coutinho, he forced his way into the box, beat a couple of defenders, and absolutely smashed the ball beyond over Subasic and into the roof of the centre of the net. A fine goal and one that bodes well for him and his side’s chances, if he’s not at full sharpness yet. A fair period of quiet followed, with little occurring in way of chances. After Rakitic (who’s one of my current favourite players out there) was replaced, only his team-mate Duje Caleta-Car, who’d earlier replaced the veteran Vedran Corluka at the back, had a chance up towards the end of the game, his header from a free-kick flying wide of the mark. Neymar’s late free-kick flew comfortably wide as Brasil looked to add some gloss to the score-line, before Firmino went on a late quest to grab the rare opportunity to net for his nation at the home of his club. Which is the better #11? Firmino scores. He wasn’t flagging! After going close twice in the lead up to stoppage time, he got third-time lucky as he ran onto Casemiro’s through-ball and fired beyond Subasic to wrap up the game with the very last kick. A nice moment for him, his smile revealing his set of very bright teeth, which were visible even to us half-way up the stand! Full-Time, Brasil 2-0 Croatia. A decent game! After the game, we popped into the Park Tavern across the way from the Kop and after a final drink in here, hopped onto a bus (£2 single) and headed back to the city centre, whilst the Brasilian and Croatian fans continued their respective parties outside what seemed to be one of the most popular venues on the day. Soon back at Lime Street station, I came up with the idea of finding the recently saved Lion pub, which had been under threat of closure after the brewer pulled out. 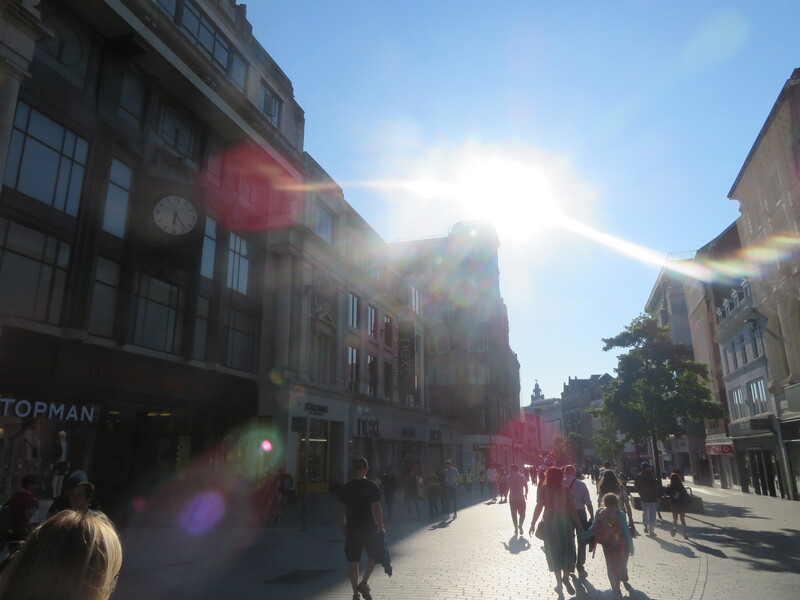 Sadly, it ended up being a little too far for us to be bothered too much on this day, and so we decided to leave that for another time and deviated instead onto Mathew Street and the famed Cavern Club. ….nor out front with Bill & Bob! 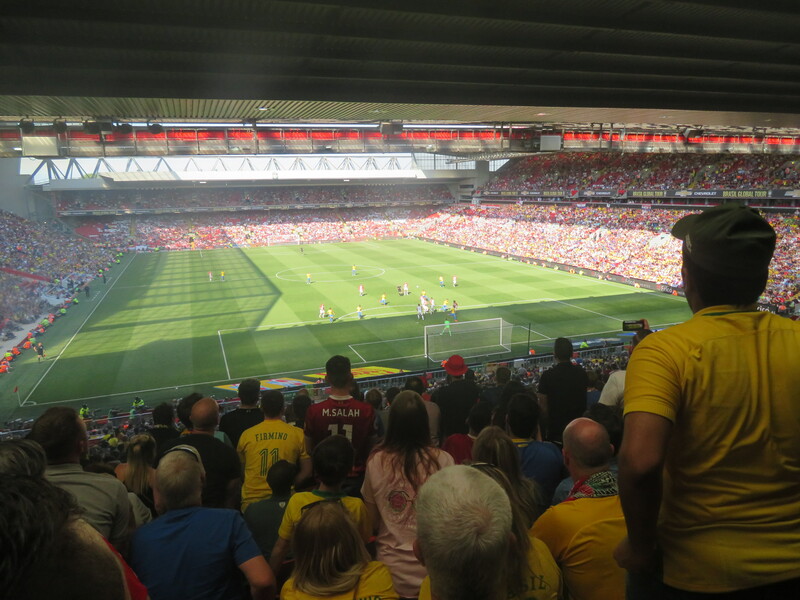 After paying the £2.50 p/p entrance fee, we descended down several flights of stairs before finally arriving in the….well, cavernous bar where I spotted a group of Brasil fans that I was sure had been in at least two other pubs while we had been there too. Crazy. 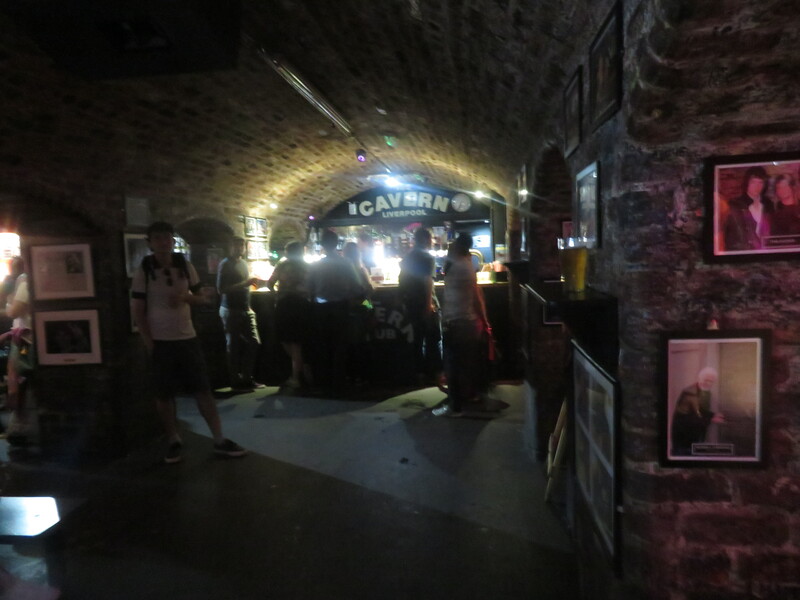 Anyway, my first experience of the Cavern was a cool one and after a couple of pints down in the depths of Liverpool, whilst enjoying the live music on offer, we headed back up onto the streets and met my Dad who’d kindly offered to pick us up again. Of course, it’d be rude for us not to include him in the tour somewhere along the way, and so a final one was had in the large, impressive-looking Crown, just over the road from Lime Street, before we embarked on the journey back home. So, there ends a trip that was a little bit different, and brought back memories (somewhat) of the strangeness of the Qatar-Northern Ireland trip a few years ago, where Matt Harrison’s (of Lost Boyos fame) dancing came to the rescue. I’m sure he’s not had to repeat the trick as of yet! All in all, it had been a fun trip and very economical as my Mum pretty much paid for everything bar the final round!! No programmes or food were tested (saving that for a Liverpool game in earnest) but the pubs were all fun and I look forward to returning soon. 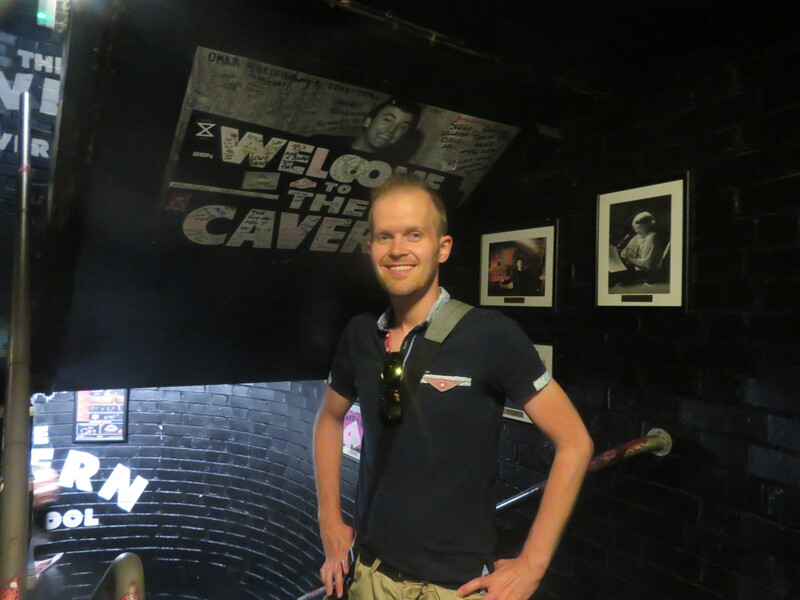 …and its famed Cavern Club! Thanks for reading my silly tales this season one and all, I really appreciate the support in what has been a difficult period. This has been my outlet from the real world, somewhat, and your kind comments, support and the massive jump in views has helped me to continue on through. So, once again, thanks to you all and see you again in….well, about 4 weeks (Jesus! )….well, if you’re not interested in my silly cricket sojourn over the summer, that is. Also, keep an eye out for my highly prestigious end-of-season awards too, which will be put up at some point. 2018-’19, you’ve got a lot to live up to…. 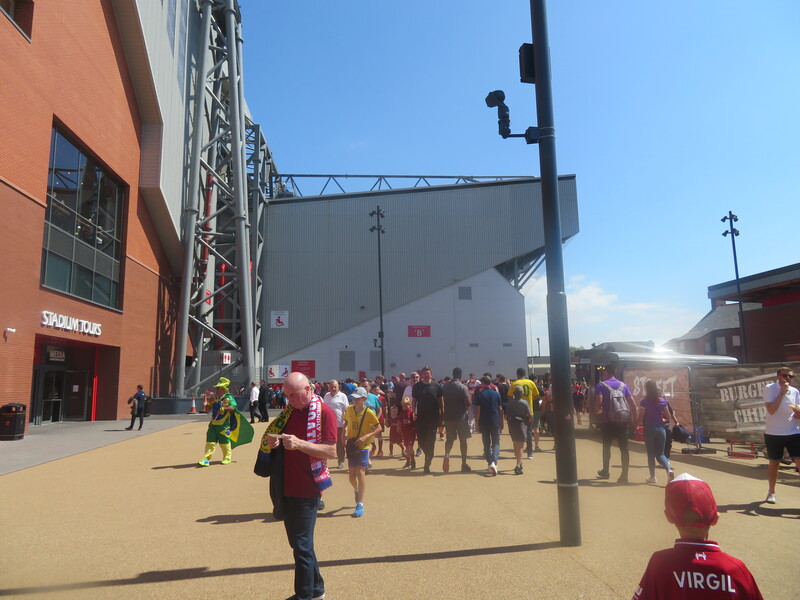 This entry was posted in Neutral Cup/International Venues and tagged Anfield, Brasil, Brazil, Croatia, Football, Friendly, Gabriel Jesus, Hrvatska, International Football, Ivan Perisic, Ivan Rakitic, Luka Modric, Mateo Kovacic, Neymar, Philippe Coutinho, Roberto Firmino. Bookmark the permalink.